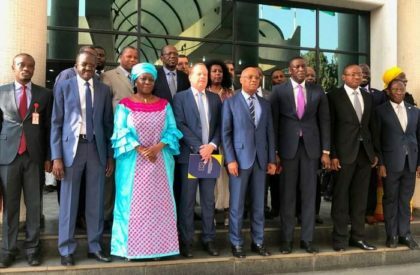 The African Development Bank and the Economic Community of West African States Commission (ECOWAS) have signed an agreement for a study into a highway linking Côte d’Ivoire’s commercial capital Abidjan, to Lagos in Nigeria, marking a new step in building regional integration and trade. The Bank has approved a financing package of $12.6 million to finance part of the study for the project and mobilized a € 9.1 million grant from the EU Commission, bringing the total ﬁnancing for this important study to $22.7 million. By linking some of Africa’s largest and economically dynamic cities, the road will promote cross-border trade and integrate fast-growing economies within the ECOWAS. This is expected to contribute to reducing the poverty levels of the population that depends on inter-regional trade for livelihood. Being a patchwork of small and largely disparate economies, West Africa needs larger and deeper market integration to justify and promote industrialization, which is so important for its development, he said. The 1,080 km long corridor connects some of the largest and most economically dynamic cities in Africa, (Abidjan, Accra, Cotonou, Lomé and Lagos) while covering a large proportion of West Africa’s population. It also links very vibrant seaports in West Africa, a feature that will serve all the landlocked countries of the region, namely Burkina Faso, Mali and Niger. The promoters of the project are expecting other partners such as Japan International Development Agency (JICA), the Deutsche Gesellschaft für Internationale Zusammenarbeit (GIZ), as well as the World Bank to join in the important project by contributing to bridge the traceable financing gap. Nearly 40 million people are estimated to be living along the Abidjan-Lagos corridor while 47 million people travel along the axis every year.